Freecharge Bus Ticket offer: Use FreeCharge wallet for Booking Bus Ticket at Redbus, AbhiBus, MyBusTicket and get extra cashback in Freecharge wallet. 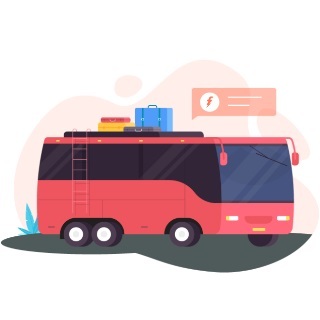 Currently Freecharge is offering flat 10% cashback on booking bus tickets at Redbus and Abhibus but if you book your tickets at Mybusticket then you will get 15% cashback into Freecharge wallet. You don't need at apply an coupon or promo code to get cashback at Redbus and Abhibus. But if are you booking bus ticket at MyBusTicket then use coupon - FCBUS100 to avail the Freecharge Bus Ticket cashback offer. Book your Bus ticket now! How to Avail FreeCharge Bus Ticket Offers? What is Freecharge MyBusTickets Offer? What is the Freecharge Redbus offer? What is the Freecharge Abhibus Offer? Earning cashback via e-wallet services is not a new thing nowadays. From online payment to booking tickets, everyone is enjoying cash backs on their orders. Freecharge, a leading digital payment platform, gives irresistible offers on bus ticket bookings. To avail such interesting offers, one has to make use of Freecharge bus ticket promo codes at the time of booking. Find here the best Freecharge bus ticket booking offers available only on Freecharge. Visit Freecharge Bus booking Offers Page. Choose the platform you want book your bus tickets from. Click on particular freecharge bus partner. On landing page, there's a book now button. Avail cashback after sucessfull booking. Cashback will be credited in your freecharge wallet only. Get 15% cashback on bus ticket bookings on MyBusTickets, provided the payment is done via Freecharge. The maximum cashback amount is set to Rs. 50 and is valid once per customer. For this, you require using the FreeCharge Bus Booking promo code “FCBUS100”. To avail the Freecharge MyBusTickets offer is applicable on the successful transaction, done on MyBusTickets platform, via Freecharge e-wallet. Under the Freecharge bus ticket cashback offer, a customer will receive 15% cashback, maximum up to Rs. 50, as Freecharge Gift instrument. The cashback will get credited to the user’s Freecharge wallet within 72 hours from the time of the transaction. The credited amount can be used to make bill payments, recharges and payments at merchant websites wherein payment through Freecharge is accepted. The validity of the cashback amount is till 1095 days from the date of credit. The offer is applicable only on the MyBusTicket website. The validity of the offer is till February 28th, 2019. Users can avail the offer once per mobile number/email address during the offer period. Under no circumstances, the entire value can be settled in cash. Partial payment via Freecharge is not allowed. In case of booking cancellation, the refund shall be processed within 10 business days in the Freecharge balance. In the case of cancellation, the cashback amount will be settled from the refund amount. Freecharge reserves the right to disqualify a user from taking benefits of the offer in case of any suspicious or fraudulent activity. Freecharge reserves the right to change/modify the terms and conditions or discontinue the offer at its sole discretion, without prior notice or specific reason, at any time. Avail 10% cashback on bus tickets booking via Freecharge e-wallet on Redbus platform. The maximum cashback that a user can earn is Rs. 75. The offer is valid once per customer and no FreeCharge bus booking promo code is required. In order to avail the Freecharge Redbus offer, users have to pay via Freecharge wallet on Redbus for booking bus tickets. Under the offer, users get to avail 10% cashback, maximum up to Rs. 75, as Freecharge gift voucher. The credited amount can be used to make bill payments, recharges and payments at merchant websites wherein payment through Freecharge is accepted. The validity of the cashback amount is till 1095 days from the date of credit. The offer is applicable only on the Redbus website. If your wallet is to dry to travel, don’t worry! We’ll drench it with Freecharge cashback! Book your RedBus ticket on Freecharge and receive a 10% cashback. Users can avail 10% cashback on their Abhibus bus tickets booking via Freecharge e-wallet service. The maximum cashback that one can earn is Rs. 75 and it is a limited period offer.